Young Adult fantasy novel Children of Blood and Bone has become one of the most talked about books this year and for many fantastic reasons. Not only is it a beautifully written story that features a resourceful protagonist on a quest to get back the magic that was stolen from her people, but it’s also an allegory and modern day fable that speaks to the everyday experiences of black people. Not only in the U.S, but it’s also a story that will resonate with black communities everywhere. In short, it’s undoubtedly worth all the accolades it’s been receiving and is already in my top five reads of this year. Children of Blood and Bone relates the story of Zélie, a young girl part of one of several clans living in the fictional town of Orisha who’ve all lost their magic through genocide committed under the ruthless and brutal regime of King Saran, a tyrannical ruler hell bent on eradicating anyone with even the remotest indication of magical power or interest. In a world now devoid of magic, Zélie can still remember a time when maji clans used to harness impressive displays of magic. Clans included every type of maji from burners (wielders of fire magic) and tiders (water magic) to connectors (mind magic) and reapers (those with power over life and death), to mention but a few. Each of the types of magic harnessed is connected to an African god or goddess who bestows the gift of magic on the different clans. But the gods have been silenced since magic was eradicated. When a chance encounter with Amari, princess of the royal throne (and daughter of the brutal King Saran), leaves her experiencing signs that magic has the power to return, Zélie must use the one opportunity that she has to strike against a monarchy set on destroying her magic and the rest of her people. It's a stunning debut novel. From the incredible and multifaceted world that goes beyond showcasing Africa (both fictionalised elements and real) as simply a continent with a history rooted in pain, to delving into issues that delve into looking at beauty standards, colourism and women empowerment, Children of Blood and Bone is as much a love letter to black girls who aren’t used to seeing themselves being represented and a beautifully written story using fantasy as a storytelling lens. I recently had the privilege and opportunity to chat to Tomi while she was in the UK promoting her book. She spoke to me a little about what inspired the idea behind the book as well as why it was so important for her to tell a story that breaks the mould of the single narrative that often plagues stories set in or are about Africa. “The idea behind the story actually came to me when I was in a gift shop in Brazil. I recently posted a picture on Instagram about the images of the Orisha (African gods and goddesses) that I first saw in that shop three years ago. READ MORE: When is the fat princess going to get her happily ever after? Often when it comes to stories about Africa or stories that are set in Africa, it usually delves into a dangerous single narrative that Nigerian author Chimamanda Ngozi Adichie once spoke about in a TED talk. 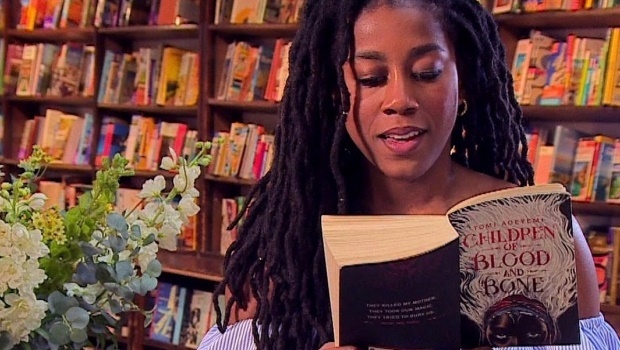 I felt that Children of Blood and Bone is not only a modern day allegory that speaks to the experience of black people but it is also a narrative that is imbued with a beautiful and complex fantasy world that explores the beauty of Africa in a way that breaks away from negative stereotypes. I asked Tomi whether this was a conscious decision on her part to write a story that not only is reflective of black pain, but also one that was about empowerment and rich with a world that people don’t often associate Africa with. It was very intentional to tell a story that was very empowering for black people but also that really portrayed that pain. “The book is, in a sense, almost for two different audiences. I've never really had the opportunity to see myself in a magical way and I was greatly affected by that. I've never seen myself represented in books, movies or TV shows and I didn't realise that that was something I needed to overcome internally until I was an adult, which is why it was so very intentional for me to put all these characters in the story and make marginalised groups realise and feel that what makes them different makes them beautiful. Tomi speaks of her characters with love and affection. When I asked her which character’s voice was the one that came easiest to her, she revealed that she had quite an affinity with the protagonist of the story. “Zélie's voice came to me - in fact her voice is basically is more typically similar to my voice, so that was my speaking voice and as a result she was relatively easy to write. (Side note: Zélie is a character that's fiercely proud, resourceful and impetuous, but you'll love her because she fights to believe in herself and the cause of her people). Anan and Amari were difficult to write because they came as characters who formed part of Zélie's story (Anan and Amari are brother and sister and heirs to the brutal royal throne. Their story lines are fascinating because each character develops in a completely different ways - both being privileged and each finding their paths diverging in dynamic ways). Anan's story was probably the one that I understood the least at the beginning and then as I grew to understand his motivations he became one of my favourites."